The cabin is significantly larger this year, so much so that the Civic could easily be thought of as a small midsize car. Since its arrival on U.S. shores in 1973, the Honda Civic has slowly established itself as a cultural touchstone. And the 2016 Civic is not only the best iteration of the nameplate ever produced, it easily once again sets the standard for compact sedans. It’s apparent from your first glance at this new sedan, which has a profile not unlike that of the unloved Honda Crosstour. This time, stylists made it work, endowing the car with a sophisticated, energetic vibe. The front wheel arches’ character line flows gracefully up front, where it anchors the heavily chromed grille. LED lighting all around lend the car a distinctive nighttime character, while large C-shaped tail lamps give little doubt as to what this car is. The savvy design acumen continues inside, where occupants are greeted by more upscale materials and a design language that accented the width of the car. Throughout the cabin, you’ll find designers made the right choices, from using one screen for infotainment, rather than two, and developing a truly slick center console bin, with any number of sliding trays and bins to hold key fobs, iPods, beverages, and mobile phones. But perhaps most importantly, the cabin is significantly larger this year, so much so that it could easily be thought of as a small midsize car rather than a large compact. This is more than mere trickery. 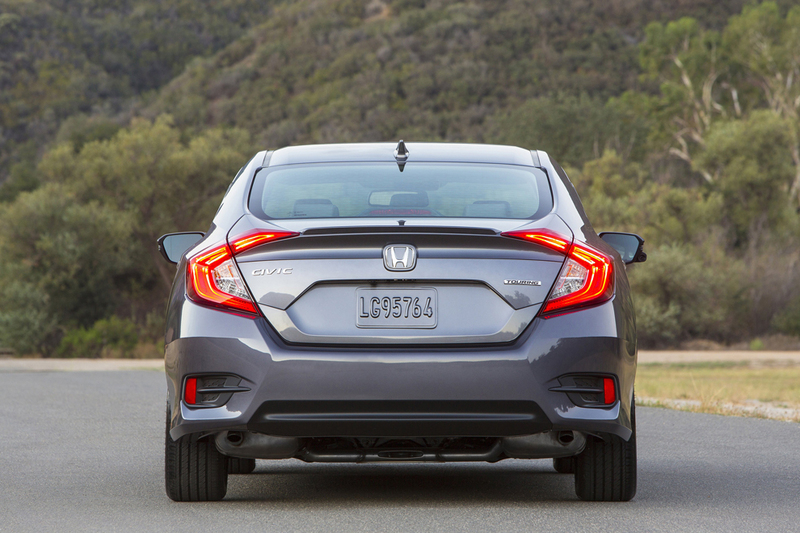 Honda increased the Civic’s wheelbase 1.2 inches; overall length is up 2.9 inches. 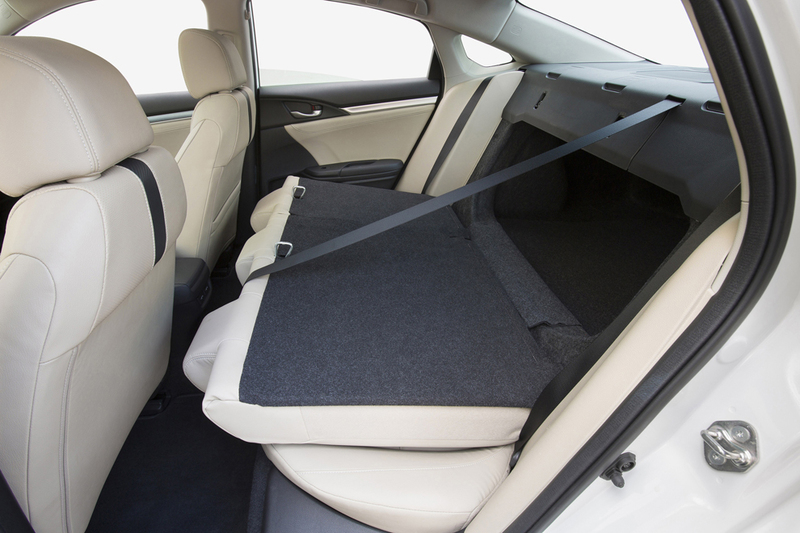 This results in an extra 3.2 cubic feet of passenger space. This is most apparent in the rear seat, which is hospitable for real adults, and boasts a seating position that sits high enough to accommodate them. Even the trunk is huge, measuring a commodious 15.1 cubic feet. None of this would matter if the car didn’t perform well. The good news? It performs better than you would expect. 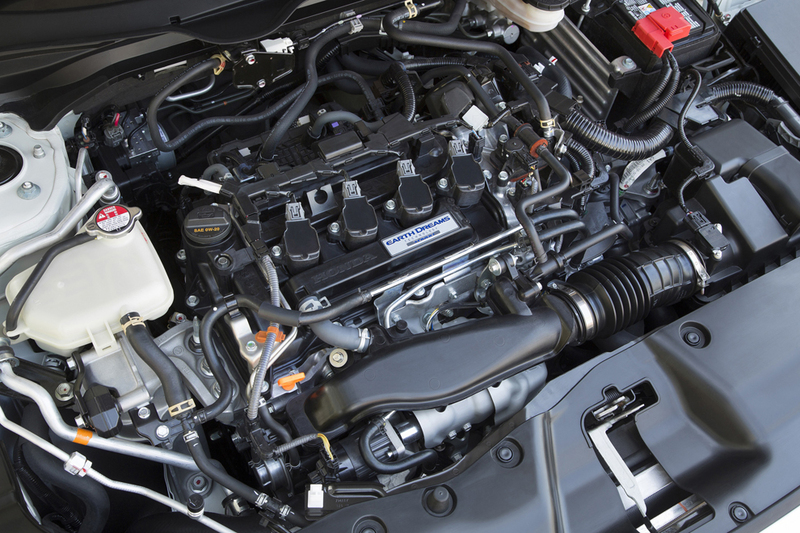 Civic LX and EX sedans are powered by a 2.0-liter double-overhead-cam, 16-valve, four-cylinder engine that generates 158 horsepower and 138 pound-feet of torque. The engine is mated to a sporty continuously variable transmission, although LX models can be fitted with a six-speed manual. It’s a perfectly fine powerplant that will find its home in most Civics, although the engine to truly consider ones standard in pricier EX-T, EX-L and Touring models. It’s an all-new turbocharged 1.5-liter double-overhead-cam, direct-injected four-cylinder engine with variable cam timing that churns out 174 horsepower and 162 pound-feet of torque. It comes exclusively with the CVT. For some, the lack of a manual is a turnoff, particularly if the box is a CVT. 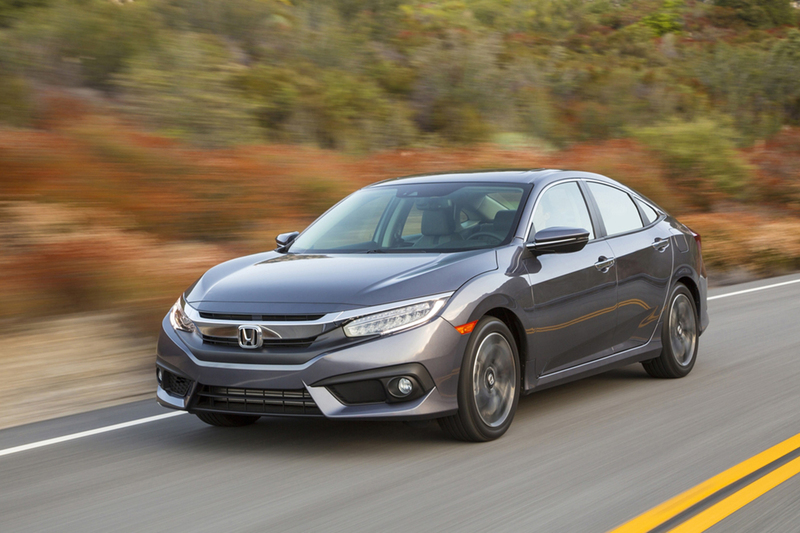 Given Honda’s history, you might expect a dual-clutch transmission. Remarkably, the CVT proves to be very well-behaved, metering out the power is strong steady flow, with little of the rubber-band feel and endless drowning of a typical CVT. Credit should go to the presence of a torque converter, which gives the gearbox its traditional feel. This allows the driver to make the most of this potent little powerplant, which suffers from little turbo lag. But it’s more than power which makes the upper level Civic’s so remarkable; it’s the ride and handling. While all Civics benefit from hydraulic front suspension bushings, toner Civics have them in the rear as well. This makes for a ride that does an excellent job of insulating passengers from road shocks. In fact, it’s nearly luxury level. This allowed engineers to dial up the sporty handling, and it gives the Civic the sporty, responsive feel drivers have come to expect, but while offering an incredibly comfortable ride at the same time. And, by opting for a higher trim level, buyers can now get some high end features, including remote engine start, electronic parking brake, dual-zone automatic climate control, heated front and rear seats, and rain-sensing wipers. All models except LX also get the new 7-inch Display Audio screen, which comes with Apple CarPlay and Android Auto. If you haven’t experienced either yet, once you do, you’ll skip the LX. Finally, drivers can get Honda’s new suite of driver assistance features, which the automaker calls Honda Sensing. All of this goodness comes at a price that’s sure to endear this car to more drivers than ever before. Prices start at $18,640, and rise to $26,500 for Touring models. You’ll wonder why Honda didn’t charge more.